As I planned for my mole unit this year, I thought about how fundamental the mole concept is for stoichiometry and brainstormed ways to really make it stick. I usually do a lab practicum at the end of every unit. I have shared about my Lab Practicums in Chemistry before. For the mole unit, I decided to do multiple mini-practicums, one for each learning target of the unit. Here are my learning targets and a brief description of the mini-practicums I did. Target 1: I can convert between mass and moles of an element or compound. For this learning target, I gave students the “mole mug brownie” recipe and conversion chart (figure 1) and asked them to convert the measurements to the dreaded imperial units we use to bake with. After students did all of their math, they did get to test out their calculations by actually making the mole mug brownie. Reviews on the actual brownie were mixed but the math concepts definitely stuck! Target 2: I can convert between the number of particles and moles of an element or compound. 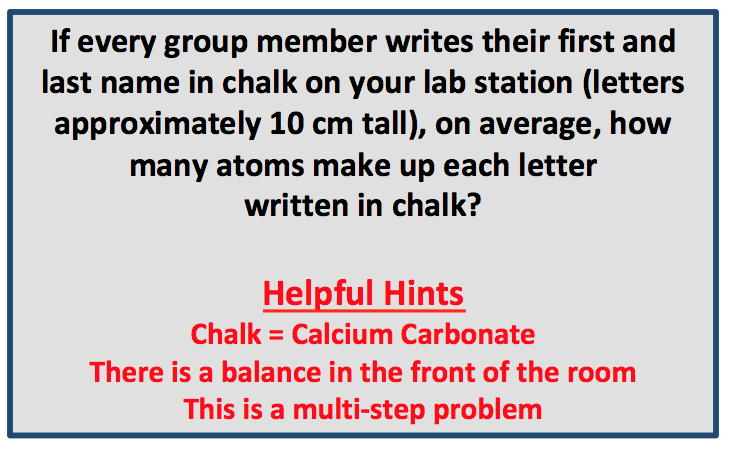 For this learning target, I gave each group a stick of chalk and the challenge in figure 2. 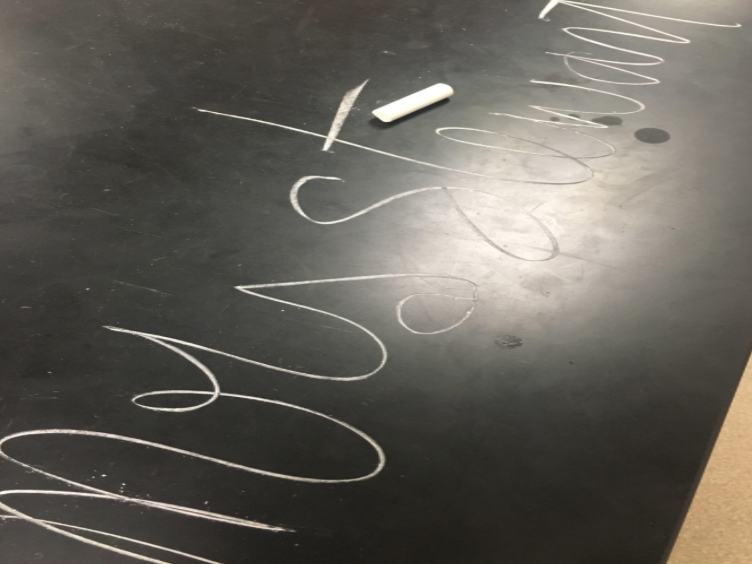 While this practicum did not have an edible element, students really enjoyed writing on their lab stations (see figure 3) with chalk! Target 3: I can relate the molar concentration (molarity) of a solution to the number of moles and volume of the solution. For this learning target, I tried something I had never done before. I gave each group a small (50 - 100mL) volumetric flask and a given molarity (different molarity for each group). It was up to each group to mix a solution of copper (II) chloride to their given molarity. I tested each group’s solution using my Vernier SpectroVis and a Beer’s Law curve I had created the day before. Students thought the spectrometer was pretty cool and enjoyed the instant confirmation that they mixed their solution correctly. Target 4: I can determine the empirical formula of a compound given the mass or percent composition. For this learning target, I used my typical end of the unit practicum, find the formula of a hydrate. I have used different hydrates in the past but this year I used copper (II) sulfate pentahydrate. If you have not done this lab before, it is super simple and yields reliable data. Students heat their hydrate in a crucible to drive off all of the water. They use the before and after masses to calculate their moles of water in their sample and ratio it to their moles of copper (II) sulfate. The only thing I provide my students before they begin is a brief introduction to hydrates and an overview of how to heat a sample using a crucible. I also have a learning target for molecular formulas (I can determine the molecular formula of a compound given the mass or percent composition and molar mass) but I did not make a separate practicum for it. Instead, I gave students the accepted molar mass for the copper (II) sulfate pentahydrate they were testing to compare their lab data to. Since the mole unit involves a lot of practice, these practicums were a nice way to break up the worksheet/whiteboarding cycle, keep students engaged and reinforce concepts! Analyzing data in 9–12 builds on K–8 and progresses to introducing more detailed statistical analysis, the comparison of data sets for consistency, and the use of models to generate and analyze data. Analyzing data in 9–12 builds on K–8 and progresses to introducing more detailed statistical analysis, the comparison of data sets for consistency, and the use of models to generate and analyze data. Analyze data using tools, technologies, and/or models (e.g., computational, mathematical) in order to make valid and reliable scientific claims or determine an optimal design solution. Lauren, I love your ideas. Just wanted to say thanks. I listened to your webinar about Standards based grading on AACT. I plan to start next year. Thanks for all that you do! Thanks for the encouraging words Chad! I'm excited about your SBG journey! Email me if you ever have any questions! I had them do 1 full recipe/group and then divide the batter into Dixie cups. It took about 45 seconds in my low power microwave but you have to play around with it. Hi Lauren, I love these ideas and will actually be doing a variation when we get to stoichiometry. A recipe is essentially a balanced chemical equation so they will be given a recipe for a cake, that does not require eggs, and asked to reduce it to 1/3 and then mix and bake their cake. I shall definitely refer to your ideas when I'm doing my edits! Thanks for the inspiration. That sounds like fun! I do the s'more stoichiometry activity going into stoich which sounds similar and always goes well! I used vegetable oil though I'm sure it would work fine with other oils.